Gibus steadfast materials and technologies guarantee great performance over time and extreme resistance to all atmospheric agents. 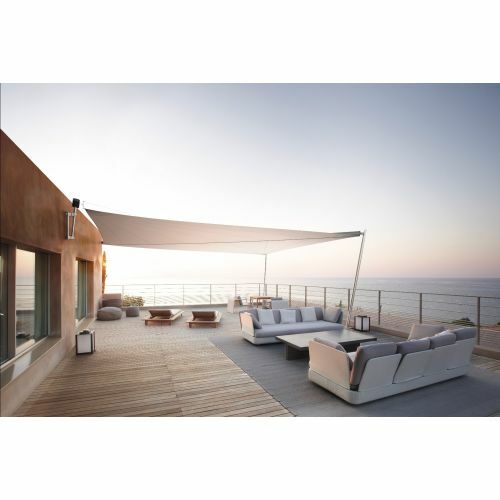 The Laminated Sail fabric offers efficacious protection from the sun, humidity and rain. The aesthetically beautiful Velenda Libre Outdoor Waterproof Awning can have up to four stainless steel masts, inclined and is anchored to the ground by means of circular feet. The nautical solutions that inspire the Velenda offers sails that open up to 10 meters and can resist winds up to 40 km/h, with motors that can close the largest sails in 10 meters.